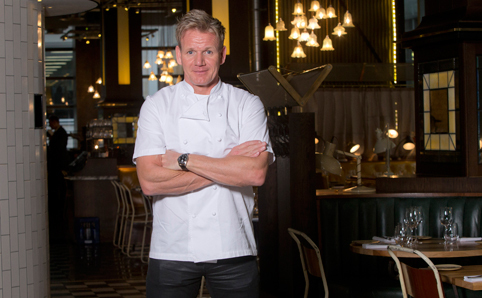 Gordon Ramsay’s Bread Street Kitchen & Bar has just opened. We catch up with the infamously foul-mouthed chef (who, incidentally, doesn’t swear once) to see what he thinks of the HK dining scene, and if he’ll be getting his hands dirty. Gordon Ramsay. The name alone is enough to strike fear into the hardiest amateur chef in his presence. The only thing Ramsay is better known for than his frank attitude in the kitchen is his even franker use of profanity. And, really, he needs little introduction. 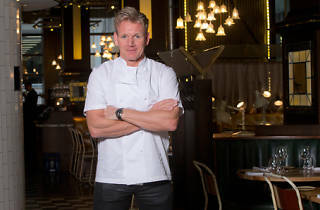 The fiery chef and TV personality’s new venture, Bread Street Kitchen & Bar – his first ever in Hong Kong – opened earlier this month in Lan Kwai Fong, accompanied by the kind of hype you’d expect from someone with the experience, gravitas and sheer brand power that Ramsay possesses. In fact,Time Out Hong Kong broke the news of the opening back in May this year, garnering waves of excitement. Ramsay’s impressive culinary empire now spans 25 restaurants around the world and he has seven Michelin stars under his belt (a belt that unlike many chefs’ is pretty small – the 47-year-old regularly runs marathons and took part in the Ironman Wales contest this month). Ramsay’s new Hong Kong restaurant is a version of the original Bread Street Kitchen on London’s Bread Street, which opened in 2011. Both venues serve British and European comfort fare in a relaxed setting. It’s been an impressive rise to the top for one of the most recognisable chefs in the world. When a bad knee injury ended a 19-year-old Ramsay’s fledging career as a professional football player, he enrolled in a hotel management course. He swiftly moved on to become an apprentice in the kitchen of the infamously volatile Marco Pierre White, at the two Michelin-starred Harvey’s in London. White has since famously claimed that he ‘broke’ his young apprentice emotionally – comments that set the tone for the ongoing, tumultuous relationship between the two decidedly shouty chefs. 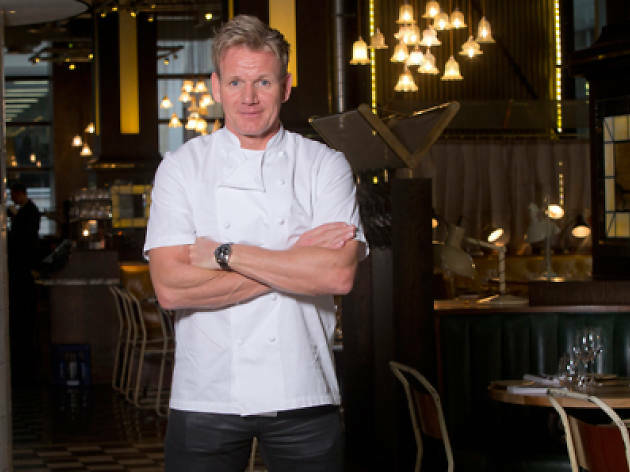 Hi Gordon – congratulations on the opening of Bread Street Kitchen & Bar here in HK! With almost 30 restaurants around the world and four television series on your plate, how on earth do you manage your time? I’m a busy person and I like it that way, which is why I’m very lucky to have an amazing team who make it all happen. I work very closely with them and they know exactly what to do to bring a new restaurant to life. We also make sure that we work with the right partners on the ground, who really understand our brand and have the same commitment to protecting it. Why exactly did you choose Hong Kong for the opening of your latest restaurant? Hong Kong has an amazing food culture and I hope Bread Street Kitchen & Bar will only add to that. Hong Kong can be a tricky market. What considerations did you make when designing the space and menu in order to suit local tastes and expectations? We always make sure our restaurants, even if it’s a concept that has come from London, are tailored to suit the local market. Even within London we have to do the same and that is part of the reason why we have 12 different concepts there. Bread Street Kitchen is hugely successful back home and we felt it was the right fit for Hong Kong but of course we’ve tweaked it! Your fellow British celebrity chef, Jamie Oliver, has just opened his venture here to much hype – it’s inevitable that comparisons will be drawn between you guys. Does that bother you? Given Hong Kong is such a vibrant food place and home to expats coming from around the world, chefs opening here is an obvious step. I don’t mind people comparing, although our offerings and business models are very different. Oliver came under some scrutiny for his decision not to make an appearance at the opening of his new restaurant. What’s your take on that? Will you be getting your hands dirty in the kitchen? We operate quite different business models and not just myself but a large number of my team have been and still are heavily involved [in Bread Street Kitchen]. To us, it doesn’t matter if the restaurant is wholly owned by us or not – we’re as committed to helping it set up, develop and evolve as if it were a restaurant in London. I will of course be getting involved, but I have also ensured that we have an amazing team in place. Our head chef, Gilles Bosquet, and the restaurant general manager have been part of the GR Group for years and by relocating them to Hong Kong they will be able to ensure delivery to the standard I would expect. Bread Street Kitchen & Bar is in good hands and I’ll be keeping an eye on them! There are recently more and more chefs who are trying to become television personalities by behaving abrasively. Would you say imitation is the best form of flattery? We think so! Well... you’ve been quoted that you quit Harvey’s because of bullying. Has that experience influenced how you conduct yourself both as a head chef and as a mentor? Harvey’s was a long time ago. The most important thing for me is to be committed and passionate and I think I am that in everything I do. You have seven Michelin stars to your name and you’re also behind 25 restaurants worldwide, including 12 different concepts in London alone. Why exactly do you choose to maintain such a wide range of eateries in so many different styles? We have an amazing collection of restaurants in London, as well as some fantastic sites around the world. It’s important to us to be creative and not rest on our laurels. However, it’s exciting to be taking one of our concepts and replicating it in Hong Kong, although we will always tailor and tweak it to suit the local market. It’s important to me to have that level of effort. How exactly does Bread Street Kitchen Hong Kong fit in with the global Ramsay brand? Bread Street Kitchen is hugely successful back home and we felt it was the perfect concept to bring to this market. I’m confident Bread Street Kitchen Hong Kong will be a perfect new destination for a relaxed evening with friends, lunch with colleagues or a family brunch. You’ll hopefully find a very relaxed atmosphere as well as great food and service. Are you thinking about opening any more of your fine dining establishments in Hong Kong and China? Firstly, Bread Street Kitchen & Bar isn’t fine dining – it’s much more casual than that. It will still be stunning, good quality food but more relaxed. For now in Hong Kong we are just focusing on this new restaurant but there is the potential to do more in the region, so watch this space. Do you have a favourite restaurant in Hong Kong? If so, what is it and why? Not yet. I’m looking forward to coming back and trying a few places. There’s a growing demographic of vegetarians and pescetarians in Hong Kong, for a variety of reasons. What’s your take on that? Are you happy to cater for them in your restaurants? You’ve said that you are horrified with the environmental cost of shark fin consumption in Asia. Imports to Hong Kong have fallen by a third in the last year, but there’s still a long way to go. How do you work towards raising awareness? My thoughts on shark finning have been widely documented and I continue to be a patron of the Shark Trust. I hope the campaign is noticed over here. There’s an episode of The F Word where you were a dim sum apprentice for a day. You marvelled at the intricacies of dim sum making. While you’re in Hong Kong will you try your hand at preparing some of the local cuisines? I would love to, if I have time. So, finally, what is going to be special at the Hong Kong edition of Bread Street Kitchen? What will keep people coming back? The restaurant will serve a British European menu, featuring dishes from the original [Bread Street Kitchen in London], using specially imported British artisanal products with local influences as well as local products. For example, you’ll find the Bread Street Kitchen’s signature short-rib burger with Monterey Jack cheese has a spicy Asian twist – with relish of Thai-style sriracha chilli sauce mayo.